Each thinly sliced bit of the sweet persimmon, paired with the slight tartness of the vinaigrette and the bitterness of the chicories, creates a lovely, balanced bite. Fuyu persimmons go out of season as quickly as they come, so get them while you can. Adapted from Martha Stewart. Serves 6. Directions: In a small bowl, mix together the balsamic, shallot, Dijon and salt. Gradually whisk in the oil to emulsify the mixture. Set aside. Rinse the Fuyus and remove the stems. Using a mandoline slicer or a sharp knife, create 1/4-inch thick slices of the persimmons, then quarter the slices. 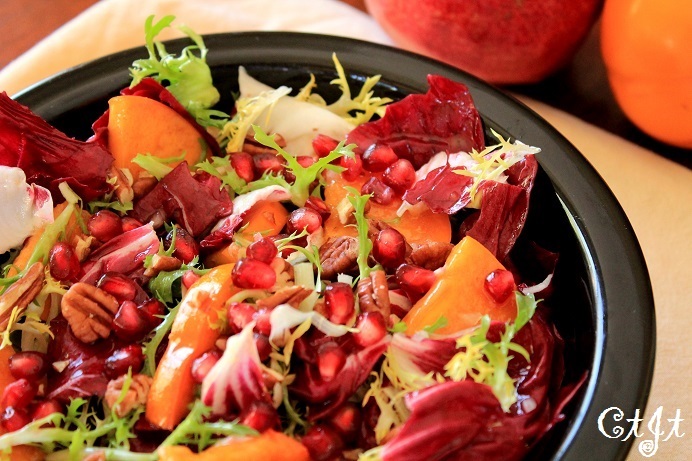 Toss the torn chicories, walnuts, persimmons and pomegranate seeds in a large bowl. Add vinaigrette, and toss well (really well) to coat. Season with salt and pepper. There are dozens of ways to make butternut squash soup, but I like to keep it simple and healthy so the flavor of the squash really comes through. The sage-seasoned pepitas add a nice earthy note to the dish, and finishing with olive oil makes for a perfect touch (try our Harissa oil for a nice kick). Serve this soup after a day of picking apples at Gizdich Ranch in Watsonville or hunting for the perfect pumpkin at Spina Farms in Morgan Hill. Serves 6-8. Adapted from Real Simple. Directions: Place the leeks, squash, bay leaf, 4 1/2 cups broth and chili powder in a large saucepan or Dutch oven. Season well with salt and pepper. Bring to a boil then reduce heat to medium low. Cook, stirring occasionally, until the squash is tender, about 12 to 15 or so minutes. Remove and discard the bay leaf. Working in batches, puree the soup in a blender until smooth (or use a food processor or handheld immersion blender). Add more broth if the soup is too thick. Taste soup; season with salt & pepper, if necessary. Add another dash or two of chili powder if desired. Meanwhile, heat 2 tsp. of the oil in a skillet over medium heat. Add the sage and pepitas and heat, stirring occasionally, until fragrant, about 2 to 3 minutes. When time to serve, ladle soup into bowls and drizzle each with about a tsp. of olive oil (or try our Harissa oil for a kick). Sprinkle with the sage-seasoned pepitas and serve. 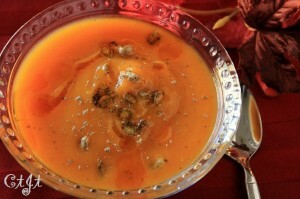 You can use any orange squash for this soup, such as the carnival, butternut, Kabocha or pumpkin. It’s a wonderful way to warm up on a crisp fall day. Recipe courtesy of Luisa Ormonde of Luisa’s Catering in San Carlos. Serves 4-6. Directions: Heat the oil in large skillet over medium heat. Add the onions, garlic, ginger and sauté for about 3-5 minutes. Add the curry paste and curry powder and cook for a minute, stirring constantly. 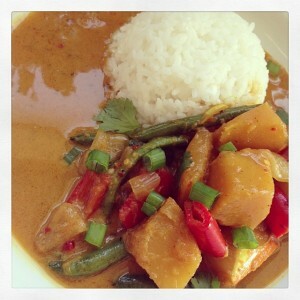 Stir in your coconut milk, soy sauce, brown sugar, lime juice, squash and stock/water. Bring to a boil, then lower heat. Simmer, uncovered for around 15 minutes or until squash is tender but not mushy (so you can slide a fork through it easily without it falling apart). Add your green beans, plus bell peppers and simmer for 5 more minutes or until vegetables are tender-crisp. Serve over Jasmine rice, and garnish with cilantro and green onions.